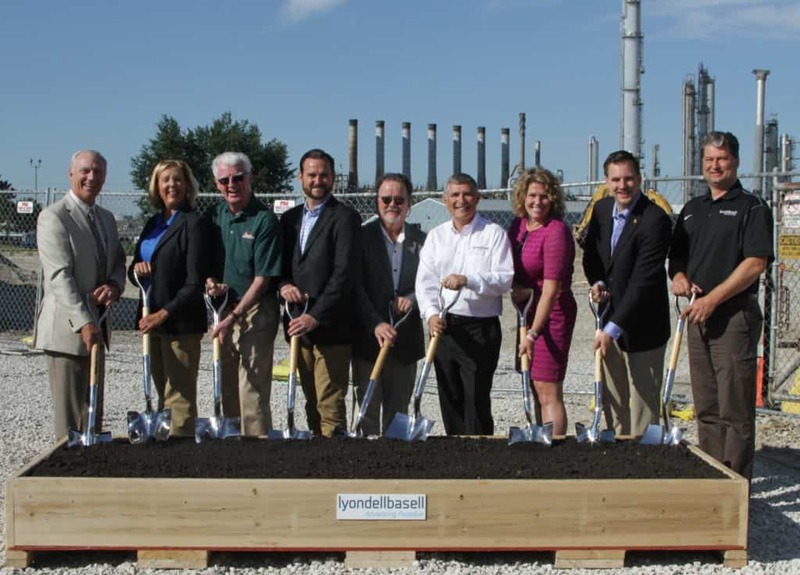 MORRIS, Ill. – July 17, 2018 – The Morris Complex of LyondellBasell, one of the world’s largest plastics, chemicals and refining companies, welcomed local officials as they commemorated the groundbreaking of the plant’s new $55 million administration building. The 89,000 square feet operations center features a control room, maintenance shops, offices and a testing laboratory. The new building is expected to be completed by the fall of 2019. “Grundy County welcomes and appreciates LyondellBasell’s decision to invest $55 million in a new, state of the art Operations Hub,” said Nancy Norton, president & CEO of the Grundy Economic Development Council. “In the last seven years, the ongoing capital investments made at the Morris Complex have created a significant, positive economic impact in our region. Lyondell continues to be a strong corporate leader in Grundy County and we are fortunate to have them in our community, creating both jobs and an economic stimulus to local workers.” The LyondellBasell Morris Complex employs approximately 350 workers and is one of the largest chemical plants in the Midwest. The plant manufactures ethylene, the world’s most widely-used petrochemical. The Morris Complex also converts ethylene into polyethylene plastic resins which serve as building blocks for various products such as leak proof and shatter proof containers for industrial and household chemicals, packaging that protects food, and children’s toys that are safe and durable. The Morris Complex generates about $260 million into the local economy annually. In 2017, the site contributed more than $45,000 to support initiatives in the areas of health, safety, education and the environment. companies in the world. Driven by its 13,000 employees around the globe, LyondellBasell produces materials and products that are key to advancing solutions to modern challenges like enhancing food safety through lightweight and flexible packaging, protecting the purity of water supplies through stronger and more versatile pipes, and improving the safety, comfort and fuel efficiency of many of the cars and trucks on the road. LyondellBasell sells products into approximately 100 countries and is the world’s largest licensor of polyolefin technologies. In 2018, LyondellBasell was named to Fortune magazine’s list of the “World’s Most Admired Companies.” More information about LyondellBasell can be found at www.lyondellbasell.com. About LyondellBasell’s Morris Complex With approximately 400 employees and contractors work on the site which covers an area of almost 700 acres. Using natural gas liquids as a feedstock, the plant manufactures ethylene, the world’s most widely-used petrochemical, which is then converted into polyethylene plastic resins. These resins serve as building blocks for countless products that provide the necessities of modern life, such as leak-proof and shatter-proof containers for industrial and household chemicals, packaging that protects our food from spoilage and contamination, and children’s toys that are safe and durable. LyondellBasell is one of the largest producers of ethylene and polyethylene in North America.